VANCOUVER, Sept. 18, 2017 /CNW/ - Hannan Metals Limited("Hannan" or the "Company") (TSX.V: HAN) (OTCPK: HANNF) is pleased to announce drill results from the second hole completed in its resource expansion program at the 100%-owned Kilbricken zinc-lead-silver-copper deposit in County Clare, Ireland. Thirteen holes are planned in this 8,500 metre drill program, scheduled to be completed during the first quarter of 2018. Two holes have been completed by Hannan at Kilbricken, and one in progress for a total of 1,986 metres. A 8,500 metre resource expansion drill program is ongoing, with two drill rigs now at site to test along strike and down dip from the mineral resource area (Hannan Press Release, 10 July, 2017). Drilling will continue through to Q1 2018. Mr. Michael Hudson, CEO and Chairman, states: "DH218 is the first hole drilled by Hannan outside the Kilbricken mineral resource, and clearly demonstrates the potential for resource expansion at Kilbricken. The higher-grade mineralization shows good lateral continuity within a broader mineralized zone totaling 55 metres down hole length which remains opens up-dip with further opportunities to extend. This is a strong start to our resource expansion drill program." 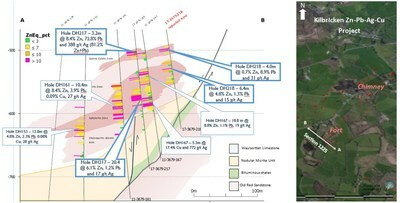 A plan and cross section view of the drill results is provided in Figure 1. Table 1 shows highlight intersections and Table 2 shows all relevant collar and assay information. The true thickness of mineralized intervals at Kilbricken is interpreted to be greater than 95% of the sampled thickness. Certain information set forth in this news release contains "forward-looking statements", and "forward-looking information" under applicable securities laws. Except for statements of historical fact, certain information contained herein constitutes forward-looking statements, which include the Company's expectations regarding future performance based on current results, expected cash costs based on the Company's current internal expectations, estimates, projections, assumptions and beliefs, which may prove to be incorrect. These statements are not guarantees of future performance and undue reliance should not be placed on them. Such forward-looking statements necessarily involve known and unknown risks and uncertainties, which may cause the Company's actual performance and financial results in future periods to differ materially from any projects of future performance or results expressed or implied by such forward-looking statement. These risks and uncertainties include, but are not limited to: The Company's expectations regarding the current drill program, liabilities inherent in mine development and production, geological risks, the financial markets generally, and the ability of the Company to raise additional capital to fund future operations. There can be no assurance that forward-looking statements will prove to be accurate, and actual results and future events could differ materially from those anticipated in such statements. The Company undertakes no obligation to update forward-looking statements if circumstances or management's estimates or opinions should change except as required by applicable securities laws. The reader is cautioned not to place undue reliance on forward-looking statements. Table 1: Highlight intersections from DH 217. Lower cut-off 3% ZnEq. Note: The zinc equivalent (ZnEq) value was calculated using the following formula: ZnEq% = Zn % + (Cu% * 2.102) + Pb% * 0.815) + (Ag g/t * 0.023) with assumed prices of Zn $2587/t; Cu $5437/t; Pb $2108/t and Ag $18.44/oz.